Become A Breastfeeding Pro In 6 Days! Disclosure: This post may contain affiliate links, which means I may receive a small commission if you click a link and purchase something. Please check out my disclosure policy for more details. All opinions are my own! Once you decide that you’re going to be a pumping momma, you are going to need to create a pumping schedule that works! When I say works, I’m talking about a pumping schedule that allows you to successfully go back to work, live your life, and still maintain a great milk supply. Unfortunately, it’s not always that easy to get your schedule “just right”. I’ll give you some great tips for exclusive pumpers and for those of you who only pump at work and still breastfeed your baby at home. Tip: Don’t miss the Pumping Pack – there’s an awesome worksheet included that will help you create your totally customized pumping schedule. Just click the button below to get yours! How Many Times Should I Pump a Day and for How Long? Are you breastfeeding when you’re home with baby? Does your body naturally produce a lot of milk? Or do you have a low supply? Typically new moms should start by pumping or feeding their baby every 3 hours. This will help signal to your body to produce more breast milk. I wrote about an awesome analogy for breast milk supply and demand over at Breastfeeding Basics that you should check out for more information. It’ll help you understand the process and be better able to control how much breast milk your body makes. If you’re trying to build a breast milk freezer stash, you’ll need to add in an extra pumping session or two to your day. 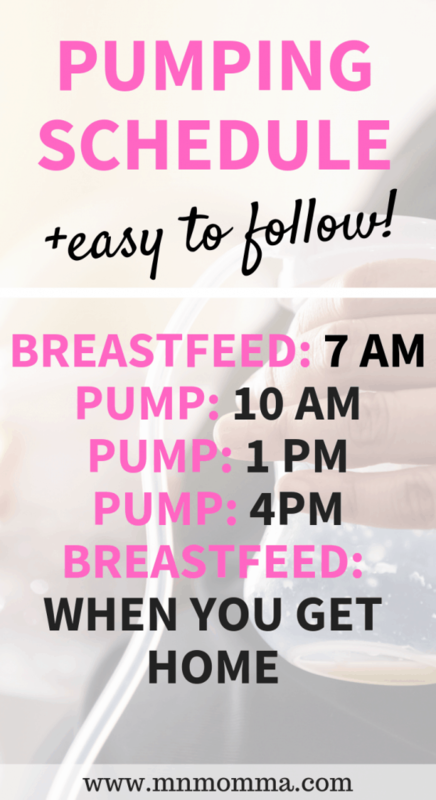 Now that you know how often to use your breast pump, let’s talk about for how long. Keep in mind that just like how often you should pump, for “how long” will vary based on a person’s individual needs and body response. Moms should pump for a minimum of 10 minutes on each side. Using an electric double pump will help speed up this process! I suggest that most moms start by pumping for 20 minutes at a time (both breasts at the same time). Not only are you more likely to pump more milk by pumping both breasts at the same time, but you’ll save precious time as well. How Often Should I Pump To Increase Milk Supply? If you’re looking to increase your breast milk supply, you’ll need to pump more often. Whether you commit to power pumping or just want to try adding in an extra session – many moms have found success by pumping more often. So Why Does Adding An Extra Pumping Session Help? Simply put, the reason that adding a pumping session into your day (or night) can increase your milk supply is due to supply and demand. When your body produces breast milk it’s trying to make exactly what your baby needs. This means that if you tell your body (through signals like pumping or nursing) that your baby needs to eat, it will produce more milk. If you maintain your regular pumping or breastfeeding schedule, your breast milk supply should be expected to remain relatively the same. On the contrary, if you add a pumping session and “trick” your body into thinking baby needs more milk, it should respond by making more milk. Keep in mind that there are several factors to making more milk, aside from simply adding a pumping session. Make sure you’re eating enough calories to produce breast milk. While breastfeeding/pumping burns calories, it also requires good healthy calories to make breast milk! Try to remain calm – stress can decrease your supply. Certain foods and supplements have the power to increase or decrease your milk supply. 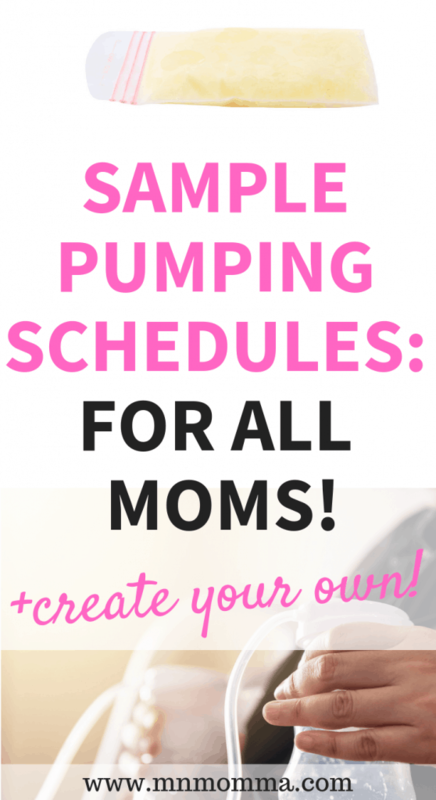 These sample pumping schedules do not have to be concrete. Feel free to adjust them to fit your needs and your personal schedule. Here’s a biggie: don’t forget to factor in time to bond with your baby and relax. 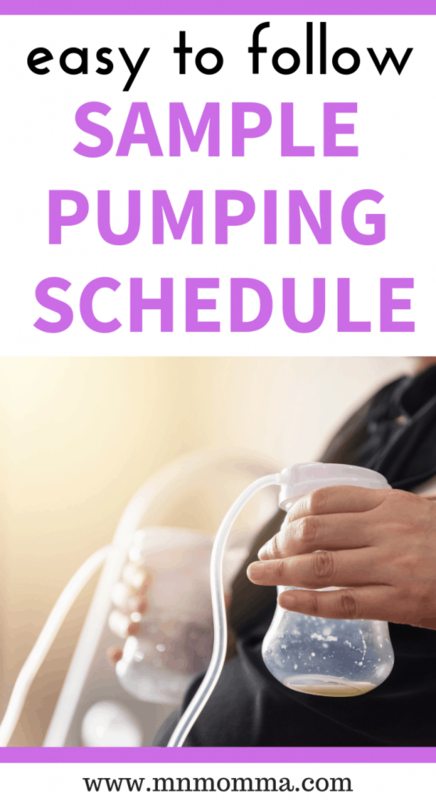 Since I know that pumping moms aren’t all the same, I’ve shared a couple different pumping schedules that should help guide you. Tip: Try not to skip any pumping sessions as this can cause your supply to drop. If you do miss one or find you’re running late for a session, try to make it up later in the day. 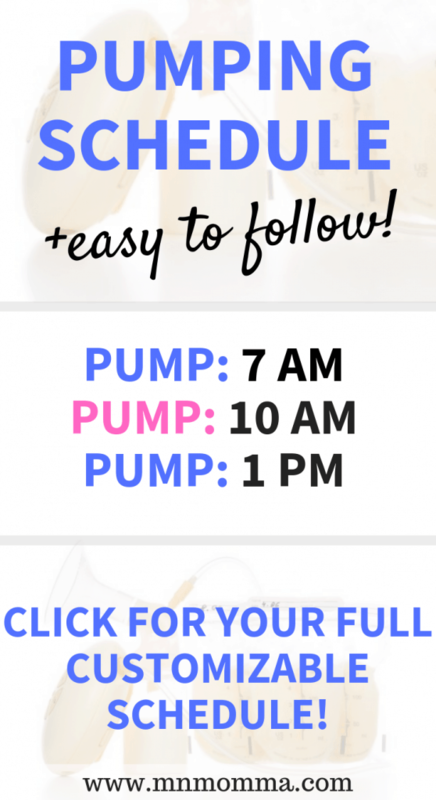 Here’s a pumping schedule for exclusive breast pump users. 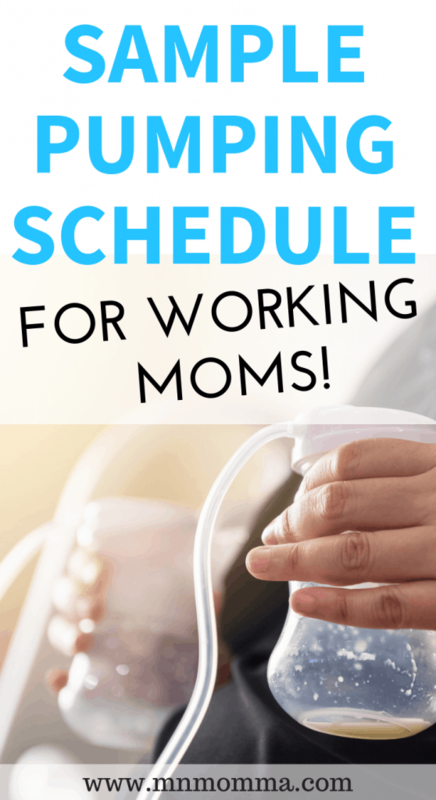 These times are ideal for all moms whether you are working or if you stay at home. Why? They focus around common break and lunch times! 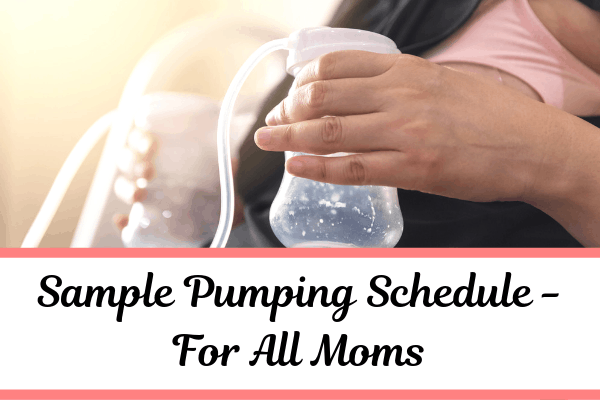 You’ll also notice that I have two different schedules, one for those moms who plan to pump 8 times a day, and another for those who plan to pump 10 times a day. Moms need sleep and time to cuddle and snuggle their new babies, so even though pumping may take a lot of time, make sure it’s not taking all of your time. *Note: These times vary between every 2 and 3 hours. Longer stretches occur during the night. 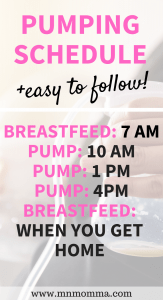 If you are a mom who chooses to breastfeed her baby at home, but pump while at work, this is the pumping schedule for you! This is the way that I chose to breastfeed and pump and I found that it worked really well (I worked 8 hour days). Keep in mind that you should be breastfeeding on demand when you are with your baby (typically about every 3 hours). Do I Have to Pump at Night? Wondering whether you have to pump at night is a common question for new, tired, mommas to have. If you are exclusively pumping, you should definitely pump at night – at least when you first start out. You want to establish a good milk supply before thinking of cutting back. Don’t forget that your baby is probably eating about every 3 hours in the beginning, so it’s good to mimic that timeline. By keeping up a pumping schedule routine, your body will gradually build and learn to maintain a good supply of breast milk. If you only pump while at work, or when away from your baby, you probably don’t need to worry about waking up during the night to pump. The exception to this is if you’re trying to increase your breast milk supply or build a breast milk freezer stash. When Can I Stop Pumping at Night or Start Pumping Less Often? One of the perks to your baby growing and your milk supply establishing a good base, is that you’ll be able to pump less often! Woohoo! However, trying to figure out when you can stop pumping at night can be a scary thought. 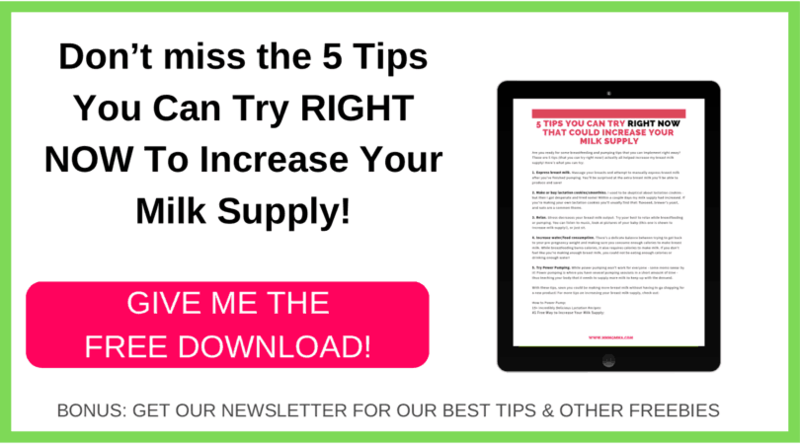 You don’t want to lose your milk supply, but you’re craving (and needing!) that extra sleep. You can consider dropping a pumping session once your baby starts sleeping longer stretches during the night (he/she doesn’t have to be sleeping all night long) and is no longer in the newborn stage. This means that your baby is no longer requiring feeds every 3 hours to grow well. Will Stopping Pumping at Night Decrease My Milk Supply? As we talked about with supply and demand, eliminating a pumping session has the potential to decrease your milk supply. One way to remedy this, is by adding more time to your other pumping sessions during the day after you’ve dropped one. Keep in mind that dropping an overnight pumping session could leave you feeling much more full in the morning – especially as your body adjusts. One other way to drop a pumping session is by just spacing all your sessions out a little longer. 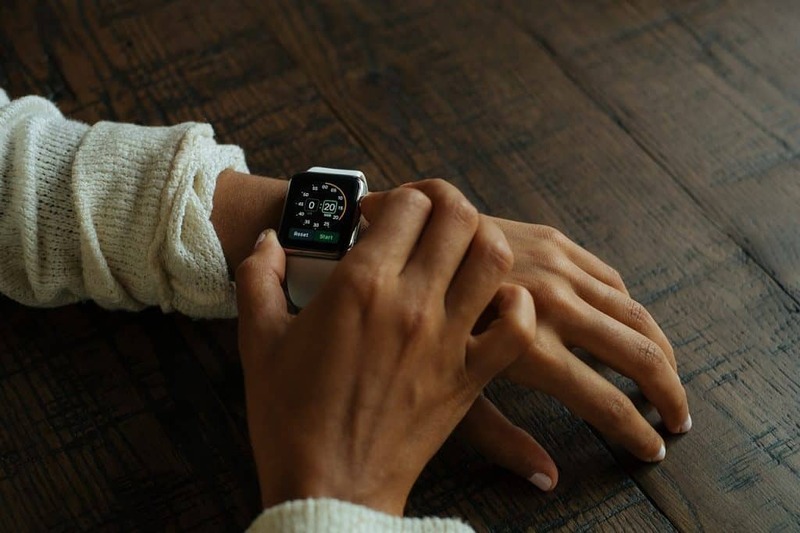 For example, instead of waiting 3 hours between pumping sessions, wait 3 ½ or 4 hours. Now you’re already down from 8 sessions a day to 6. You did it! You have gotten rid of a nighttime pumping session. If you do notice a drop in supply, you may need to reconsider whether or not you want to drop your overnight pumping session. Now that you’ve seen a sample pumping schedule and learned to customize it to your needs, you can create your own! For a super easy walk through to create your own pumping schedule grab this Pumping Pack. Get your free 6 day breastfeeding basics course sent right to your email! send me my free course! A happy and healthy family is my goal! 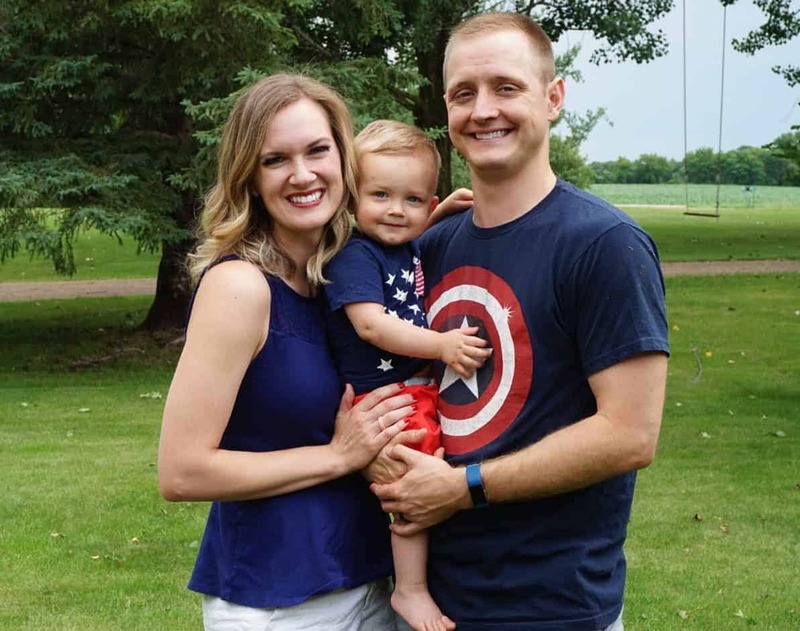 Tag along on this pretty amazing adventure with Minnesota Momma (I promise, even if you’re not Minnesotan – I’ve got you covered!). Please follow & Like Minnesota Momma! Access the FREE Resource Library! Sign up for access to the Resource Library! 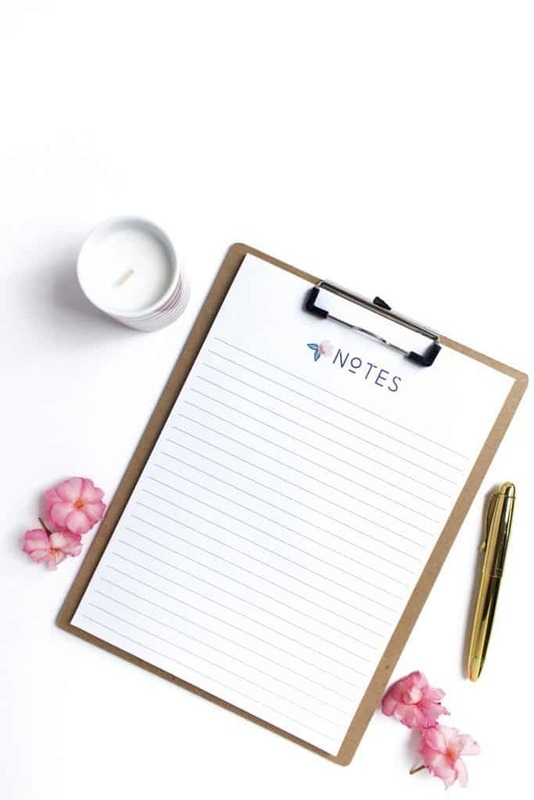 Everything from ultimate new mom checklists, helpful pumping worksheets, workout goals, and more! Note: The content of this website/blog are for informational purposed only. This isn’t medical advice and if someone relies on it to their detriment, I am not liable or promising specific results. All babies/children are different and what works for ours may not work best for yours.